The photography volunteer will be attending graduations and fundraising events to assist us with the photos and video production process, i.e. planning, shooting, editing, and posting. The aim is to promote the EXPONENTS brand in the local and online community. 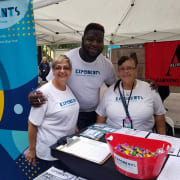 EXPONENTS volunteers have the chance to work closely with the Executive Team and have the opportunity to make true, meaningful impact in their time with the organization. Though this is a volunteer opportunity, college students can receive college credit. Commitment is 10-15 hours a week. Interested applicants should apply for this volunteer opportunity by submitting a resume. Candidates for initial phone screenings will be contacted in late January - mid February 2019. Commitment is 10-15 hours a week.